Ankylosaurs have had a good few weeks, publicity-wise. First we get some actual science done on the long-held belief that they were prone to "bloat and float" (if you don't like to contemplate recently deceased animals, I will simply say yes, it looks pretty good; if you'd like a less-technical summary, go here). We've also now got the oldest record of a true tail club, wielded by the newly minted Jinyunpelta sinensis. The early evolutionary history of ankylosaurs is a bit on the cloudy side. We have hints going back to the Middle Jurassic (and farther depending on your feelings regarding Scelidosaurus), but aside from Gargoyleosaurus and Mymoorapelta in the Morrison, picking are slim in Ankylosauria until you get to the Barremian, 125 million years ago or so. There was some hype around Tianchisaurus in the early 1990s as a Middle Jurassic ankylosaurid, although in hindsight part of that hype was probably due to cross-pollination with Jurassic Park (Tianchisaurus was for a time known informally as "Jurassosaurus", and its species name is made up of portions of the names of several of the film's primary actors). This is more or less the only thing you ever hear about Tianchisaurus these days, as it hasn't proven to be very helpful as a taxon (Arbour and Currie 2016). Incidentally, Tianchisaurus is not the only ankylosaur to be connected to Jurassic Park; we've also got Crichtonsaurus and Crichtonpelta, both named for Michael Crichton; the latter was originally described as a second species of Crichtonsaurus but was later given its own genus due to problems with Crichtonsaurus (Arbour and Currie 2016). Anyway, we were back in the late Early Cretaceous before I let myself be distracted. By the Barremian we've got differentiation into nodosaurs with standard-issue shoulder spines, polacanths (a term made up just now for when you're not sure whether to use "polacanthines" or "polacanthids") with the "Armor Supreme" loadout, and ankylosaurids with a more modest selection of scutes. Ankylosaurids are known for their tail clubs, but the club is a specialization limited to a subgroup. It's also a composite structure, including a handle of interlocking vertebrae and a knob, which is, well, you can probably guess. As described by Arbour (2014) and Arbour and Currie (2015), the handle appears to have come before the knob, i.e., the end of the tail became stiffened before the expansion of any existing tail armor into the classic knob. At least one ankylosaurid with an incipient handle was known to be present in the Early Cretaceous (Liaoningosaurus), but actual knobs have been harder to come by, with a couple of equivocal reports mentioned in Arbour and Currie (2015). This is where Jinyunpelta comes in. Figure 6 from Zheng et al. (2018): a bonafide handle plus knob. Genus and species: Jinyunpelta sinensis; "Jinyun" for Jinyun County and "pelta" (Latin for "small shield") being a typical ankylosaurian suffix, and "sinensis" for China. Stratigraphy and geography: Liangtoutang Formation (Albian–Cenomanian, Lower–Upper Cretaceous), Lijin Industrial Park, Huzhen, Jinyun County, Zhejiang, China. Holotype: Zhejiang Museum of Natural History (ZMNH) M8960, most of the skull (missing the posterior region), two cervical vertebrae, a partial dorsal, three sacrals fused to each other and the left ilium, a partial tail club, ribs, left scapula, right humerus, a hand, a partial ischium, and a partial femur. Paratype ZMNH M8963 adds a few more bones (tibia, fibula, and more complete tail club). The discovery site also preserved fossils of at least three other ankylosaurs, not prepared at the time of description. Figure 2 from Zheng et al. (2018): the opposite end (the skull, dorsal, ventral, and anterior). Jinyunpelta has been classified as an ankylosaurine, Ankylosaurinae being one of the clades within Ankylosauridae (technical definition: all ankylosaurids closer to Ankylosaurus than to Shamosaurus). 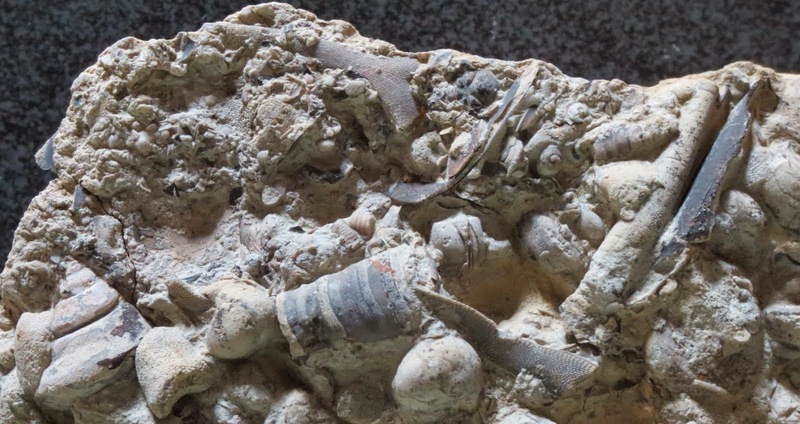 It is currently the most basal member and among the oldest, at approximately 100 million years old, which also pushes the record of definite clubs back some 20 million years. Arbour, V. M. 2014. 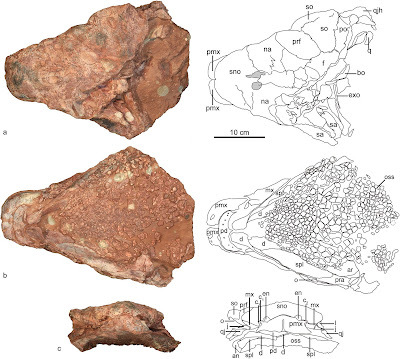 Systematics, evolution, and biogeography of the ankylosaurid dinosaurs. Dissertation. University of Alberta, Edmonton, Alberta. Arbour, V. M., and P. J. Currie. 2015. Ankylosaurid dinosaur tail clubs evolved through stepwise acquisition of key features. Journal of Anatomy 227(4):514–523. Arbour, V. M., and P. J. Currie. 2016. 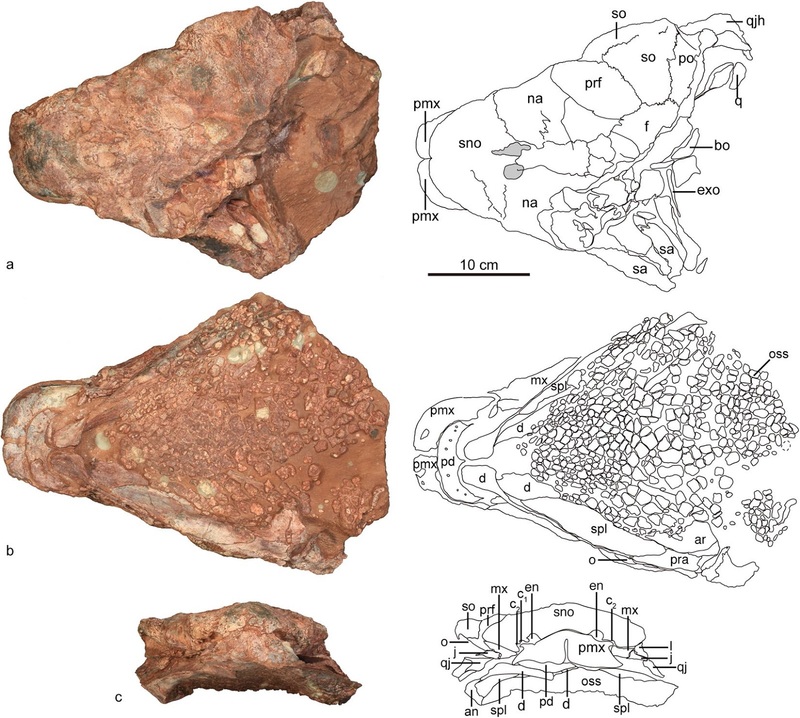 Systematics, phylogeny, and palaeobiogeography of the ankylosaurid dinosaurs. 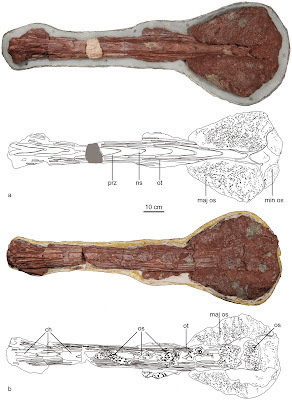 Journal of Systematic Palaeontology 14(5):385–444. This is insane! Ankylosaurs are having a really good year already, since Penkalski just named three. I can't see them sticking around long though... how many Euoplocephalus clones do we have now? We'll see, we'll see... although from a quick glance I am somewhat confused as to why the types of Anoplosaurus inceptus and Scolosaurus thronus do not form exclusive clades with the types of A. lambei and S. cutleri in the specimen-level analysis. 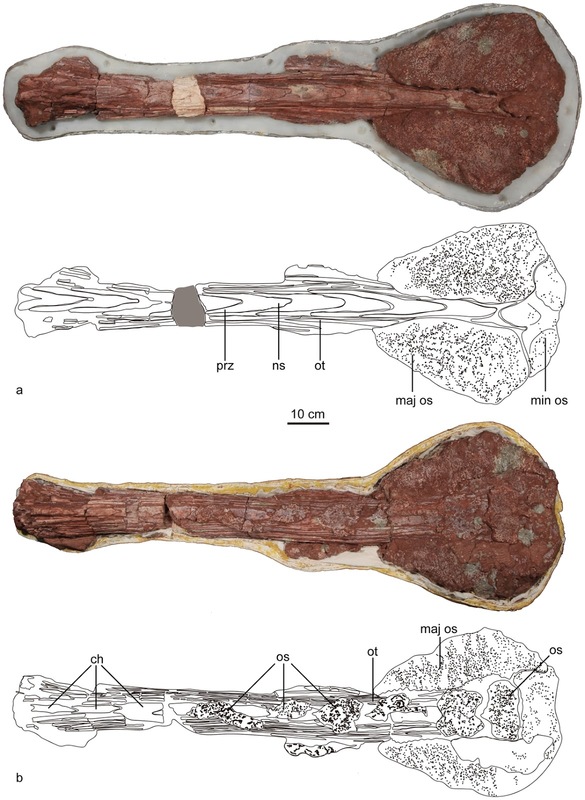 The cladistic tree that doesn't recover ROM 1930 and AMNH 5404 as sister to Scolosaurus cutleri that you mention is the 50% majority consensus tree, but the strict consensus tree of Penkalski (2018) recovers both S. cutleri and the S. thronus holotype in a clade to the exclusion of other Euoplocephalus-like ankylosaurines. The Anodontosaurus inceptus holotype and referred specimen were startlingly referred to A. lambei by Arbour and Currie (2013), given that they are older than CMN 8530 and Horseshoe Canyon Formation dinos are generically distinct from those in the Belly River Group, even though the Dinosaur Park Formation has yielded horned dinosaurs somewhat similar to Pachyrhinosaurus and Anchiceratops morphologically. Imagine Victoria Arbour conceding that the referral of TMP 1997.132.1 and AMNH 5238 to Anodontosaurus lambei was only tentative and likely to be questioned by future study. These things are giving me a headache. Possibly related: the intrusion of Anoplosaurus for Anodontosaurus in my previous reply.